Thank you for your interest in our Delivery with Service Menu! 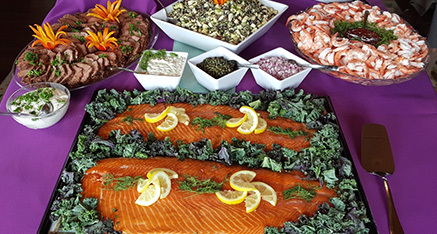 The following tasty dishes are designed to be delivered hot and ready to go, and are ideal for office meetings, open house celebrations, cocktail receptions, memorial services or casual wedding receptions. At least one staff member remains on site to maintain the buffet and serve your guests. These are just a small sampling of menus available. Call us today and let your personal party planner assist you! View delivery menu options and pricing.